Pipes grow old, too. Each passing year adds another wrinkle to the sewer lines until eventually they pose so great a risk that they have to be replaced. But isn’t replacing them a chore tangled up in dust, mud, and countless holes in your yard? Not with Rooter Drain Experts; we have devised a trenchless sewer pipe lining method that will leave your driveway completely intact and solve your sewer concerns for decades to come. All the glitz of the Santa Clarita, California area is mirrored by the far less glamorous underground, as many of the water pipes in the city have passed the four decade life mark. Lines this old are a liability; no one knows how long they’ll last. The materials used in the 70s like iron or clay are outdated now, susceptible to an unusual amount of corrosion and root intrusion. 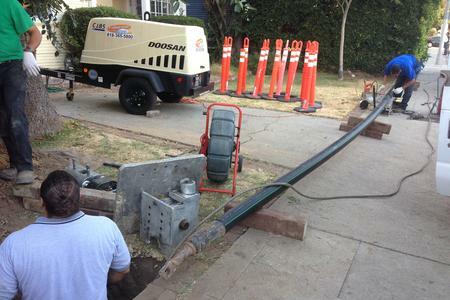 The new trenchless sewer pipe repair method has been in use for more than a decade. It’s gone through several major improvements since then and is now an exceedingly dominant way of dealing with plumbing issues. At Rooter Drain Experts we have grown with the industry and are now at the peak of our success. We provide quality lining services all round Los Angeles at more than competitive prices. We are big on satisfying our customers every time, since that’s how we got to this point. Sewer pipe lining is our specialty. First off, we start and finish every job with a detailed sewer camera inspection. The main part of lining process is inserting and inflating the specialized epoxy resin impregnated tube where the new line should be, inside of the existing corroded pipe. The resin liquid hardens after we treat it and forms pipe-within-a-pipe sustainable system. We own every piece of equipment we use, and our trained technicians know them by heart. The pipes we cure in place are guaranteed to last a long time. No Digging: the greatest benefit is the self-explanatory one – there’s neither the incentive nor need to dig anything but the access holes to rehabilitate the sewer pipes. Think of all the trouble this avoids! It’s less expensive: think of all the money you’ll save not having to bother with cleaning anything after the repairs. No digging means no mess! Less Intrusive: trenchless sewer lining requires minimal participation on your side. We cover the entire job organization from the initial sewer camera inspection to the finishing one. You just sit back and enjoy. Your plumbing pipes aren’t getting any younger. The more you wait, the greater risk you’re exposing yourself to. Operating in Santa Clarita, California we can be at any place in the city at the short notice. Call Drain Rooter Experts now and we’ll deliver the goods.